Modhna is a Breton warrior and vampire living in Volkihar Keep. She is a low ranking member of Lord Harkon's court and can usually be found feeding on a human cattle. She says that she doesn't care about politics and she only serves the lord of the castle. She often tells you to leave her alone. Her attitude doesn't change even if you become the leader of the Volkihar vampires. Modhna wears a set of red colored vampire armor with a matching pair of boots. She is equipped with a leveled one-handed weapon which can be up to elven quality. She carries random leveled bandit loot, and has a 25% chance of carrying 1-9 gold. She uses one of the following greetings when spoken to. She may tell you what she does: "I leave politics to others. I serve the lord of the castle." She may briefly tell you about resources: "I have everything I need right here." When sitting in the main dining hall of Volkihar Keep, she may tell you: "Find your own thrall. This one's mine." She may simply dismiss you, wanting to be alone: "Leave me in peace." 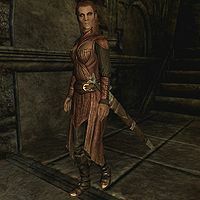 If the player sided with the Dawnguard, she will be one of the Vampires outside the front gate during the quest Kindred Judgment. This page was last modified on 3 September 2018, at 23:56.